It is rare that a book hits as close to home as this one did to me. I just finished it and there are real tears that won't stop running down my cheeks as I try to type this review. My Mom is 91 and although in good shape she is starting to exhibit signs of dementia as outlined in this biography, which like Elaine I attempt to almost ignore. My Mom is also very good at covering up--we won't talk about all the things she misplaces. My Grandmother, my Mom's Mom experienced very early dementia and it was always a fear of my Mom's that she would as well. Well, at the very least as I remind her-she got her genes from her Dad's side of the family. There is a scene in the book where Christy was visiting her grandmother with her Mom and kept smiling at her, but didn't know why. I remember distinctly my Nana not really remembering who my Mom was but would ask who is this pretty girl-she was referring to me. My Mom still lives in her own apartment and has a car which she still drives on occasion. I generally go and take her where ever she wants to go so she doesn't drive distances! She can still play Bridge and Mahjong and does the Sunday Times Crossword puzzle. But I do see the differences, just like Elaine did. Her memory of long ago things are not quite accurate and yes, she does get belligerent if I point it out--so I don't anymore. This had to be a very hard book for Elaine Pereira to write-it is truth not fiction but it is a book that ALL should read. There is a poem at the very end which I will leave you with. I don’t remember where I am. I really can’t add two plus two. I don’t recall what you just said. I’m sure it’s sweet, if I just knew. I don’t know what clothes to wear. I need Depends to hold the pee. My hands tremble when I eat. My hearing’s gone, though I can see. The apartments here all look the same. If I’m in your bed, just let me be. I don’t know what season it is. The days all seem to be the same. Soon I’ll join my Boys and Wayne. But I don’t always recall your name. That you are my daughter, Elaine. I would love to read this one. My heart is heavy reading about your mom's situation and your grandma's. I remember my great grandma's last days and know exactly what the poem reads. My grandma did not live enough to get to this point because she died in her 60's of Parkinson's. I guess if we look at the positive side, it is a blessing to live that long. God bless you! Tears are welling up my eyes as I was reading the poem. What more if I read the entire book? Well this is one that would have me in tears, I only got down about a paragraph and felt the tears coming. My grandma recently, well a couple years ago suffered from dementia. It was very hard to talk to her cause it broke my heart. This one would probably have me in tears, too. I don't have any personal experience, but it still sounds touching. What a wonderful age your Mom is and so independant too, a girl after my own heart as I love playing Mahjong too. I friend just laid to rest her MIL that struggled with dementia and it was so hard on the family. Thanks for the giveaway. In high school I worked in a Nursing Home and there were a few residents that had different stages of Alzheimer's...thankful so far my family hasn't had to deal with it personally --but it takes a strong person to write their own story to help others through. This would be a tear jerker for me as well. My grandmother had dementia and I pray it skips me. So sad to live through and watch. This sounds like a VERY touching and moving story! Definitely looks worth the read. Thankfully, I've not had to deal with that yet and hope to never have to. My kids grandmother is going through this and it's tough speaking with her because she forgets things so easily and it seems like you're stuck on repeat most of the time. This book would surely bring tears to my eyes. I'm going to have to put this on my TBR Kindle list. Thanks for sharing this review. One of my grandmothers had Alzheimer Disease and my other grandmother had dementia. This story would definitely strike a chord with me. Just reading the poem made me tear up. what a beautiful tribute to her mom. Not sure I could read this after losing my grandma to this disease but a sweet tribute. I would love to read this my mother is showing signs. My ex-husbands grandmother along with my best friends mother had suffered with this disease. Thanks for sharing. This would be hard to read, but I think I will do it anyhow. It sounds like something I would enjoy (for lack of a better word). My mom is showing signs of this now too and it's so scary. This would be such a touching read. I can't imagine going through this personally. Alzheimer's is such a scary disease because it is easy to not see and understand for so long. This seems like a story that will help a lot of people in many ways. Very clever cover page the message hit me straight to my heart. Makes me miss my mom so much. This sounds like a great book. I really need to add it to my TBR list. My grandfather had Alzheimer's and it was so sad to see what he went through. How touching that you've shared a bit about your mother. It's tough when what we are pointing out is not well received. We went through it a bit too with my husband's grandmother. It's nice that this book giveaway is for a signed book! That makes it extra special. This book really does sound like a tear jerker. Just the daughter and mother picture got me choked up. Thank you for the giveaway I hope that I win. I would love to read it. This one looks close to home for me as well. My grandmother shows early signs of dementia and my mom takes care of her...they have a very special bond, but it is hard at times. I'll definitely be checking out this book! This would be great for a summer read. This would make me miss my Mom so much! Thank you for sharing about your mom! My dad started experiencing memory problems that were suspected dementia related (from alcoholism) and I noticed it, but I didn't have to deal with it on a regular basis since we lived far apart and rarely communicated due to our history. I could not imagine having to watch a parent go through such a thing! Hugs to you! Wow!! 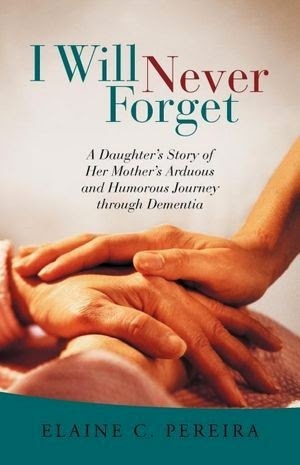 This book reminds me of my dear Grandma who had dementia. There were hard days and great days especially the good laughs that grandma did. It's been a while since I've read a biography, being engrossed in mysteries these days mostly, but this book seems to really hit home with a lot of people, so I think I'll have to check it out. That's a blessing to still have a parent living. Also, I love the poem. That is so true! I could relate to this as my mother-in-law suffered with dementia and it was so hard to communicate with her. cool giveaway..i hope i win..